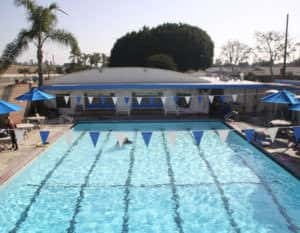 Blue Buoy Swim School, located in Tustin, CA, has two pools impeccably maintained and specifically designed for swim lessons that are kept at a very comfortable 90 – 93 degrees all year long. Gas heaters & umbrellas keep the deck area around the pools comfortable in both cool and warm weather. Our smaller enclosed pool is designed with young swimmers in mind. It has large steps and water ranging from 2 to 4 feet. The shallow water is perfect for infants and toddlers as they develop their important foundation skills. It provides the perfect environment for building confidence since even very young children are able to walk in the 2-foot area. The large pool has water ranging from 3 to 8 feet. It is used by advanced young children and older students who require more space, deeper water, practice on their racing dives, ip turns, or even a chance to improve their balance on our stand-up paddle board at the end of a lesson! 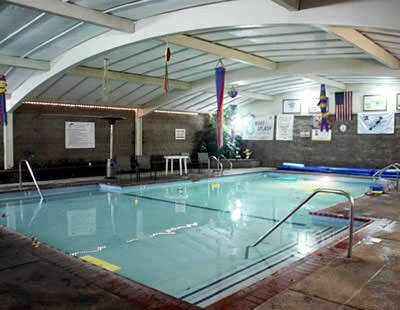 It also provides plenty of room for our stroke technique classes, open swim, weekend swim meets, and adult classes.